When Gabe and I first started our fitness journey nearly two years ago, we did a lot of research on fitness supplements. Multiple family members of his all agreed on one thing - protein powder. 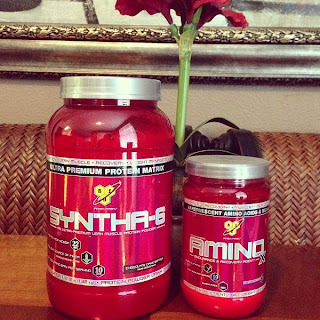 This is how I was first introduced to BSN in 2011 with their Syntha-6 powder. We ventured into a vitamin store and spent ten minutes agreeing on one flavor, which was a difficult task considering the selection BSN offers. In the past two years, we have purchased vanilla, chocolate, strawberry, cookies and creme and vanilla ice cream. Of those four flavors, I was partial to vanilla ice cream while Gabe was a supporter of cookies and cream. It's my go to quick breakfast, either mixed with milk or in a protein shake. Two years later and I still have a love affair with BSN Syntha-6 protein powder. I was fortunate to get on a campaign with BSN. One day, I came home to a box of two full sized products from one of my favorite fitness brands and I couldn't have been happier. Since the product selection was my choice, it was very hard not to grab two containers of protein powder, since this was familiar to me. I needed to take this moment to try out BSN's other products and mix it up. I tried out a new flavor of Syntha-6, Chocolate Cake Batter along with their AminoX in Watermelon. Woah nelly. I have a confession, unless we are talking about molten lava cake, I am not a huge fan of chocolate...but Gabe is. 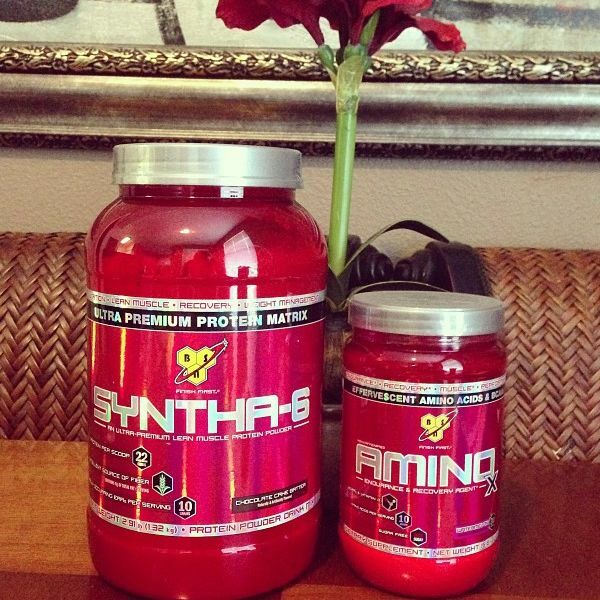 The last time we bought Syntha-6, we ended up buying two flavors. We were unable to come to an agreement on one flavor to share. While I do not love chocolate like the next person, my favorite moment as a child was getting the coveted mixer whisk while my Mom was making chocolate cake. 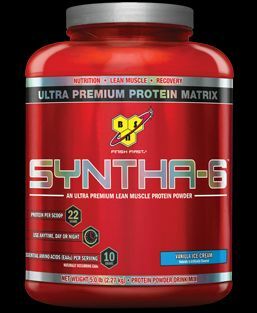 When I saw Syntha-6 had Chocolate Cake Batter protein powder, I knew I had to give this flavor a try. It tastes exactly like those whisks I ate as a child and still love as an adult. The chocolate cake batter was perfection and we have finally come to an agreement on a flavor, for the time being at least. Since Gabe and I started working out, we have always used a BCAA product but this was the first time I have tried AminoX from BSN. Flavor wise, you better love watermelon Jolly Ranchers if you get this flavor. Once you get past the watermelon flavor, you know you have a great produt. 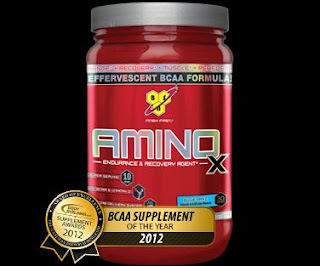 It was named the BCAA Supplement of the year in 2012. BSN®’s highly-anticipated entry into the amino acid market: AMINOx™ – the first Effervescent Instantized Amino Acid Endurance and Recovery Agent. AMINOx™ is designed to support: Protein Synthesis, Muscle Sparing, Recovery, Endurance. BCAA's are and always have been a staple part of our fitness routine. I truly believe this is part of a fast recovery. It was no shock to me that BSN won the award for the 2012 BCAA supplement of the year. I am and always will be a fan of BSN! BSN has a contest going on for the two products I reviewed above. Their contest has nothing to do with my review but thought I would give you the opportunity to enter and win! Click here for more details. Disclosure: I was provided with BSN supplements in exchange for this post. As always, all thoughts and opinions are my own. Who doesn't love watermelon??! Thanks for the info...its nice to have you give the explanation and how you like it because there are so many of them out there. I pay a quick visit daily а few web ѕіtes and sites to read content, but this ωebsite proviԁeѕ feature bаsed writing.